I absolutely love cupcakes! I've tried Crumbs, Magnolia, Butter Lane, and my old time favorite Buttercup! Each cupcake offers a unique appearance and eating experience. Some are huge cake like sizes, others offer layers of cream, and some come in outrageous flavors and toppings. I prefer the classic cupcake. It’s simply dressed, perfectly coated with a delicious whipped cream that satisfies your sweet tooth and comes in flavors (and sizes) similar to those that Mom use to make. My favorite cupcake flavor is Red Velvet-I simply love the chocolately flavor and the deep red color, not to mention the cream cheese frosting!!! For those who have never seen them before they are usually taken by surprise since the taste does not reflect the color. This weekend I prepared 200+ cupcakes for P.S. 203, an elementary school in Bayside, Queens. The event was Family Night Out where parents and their children took part in events like movie night, photography, nail painting for the girls and an art workshop. I offered a cupcake decorating station with the help of my assistant (and loving husband) Alex. The children purchased a blue ticket (which also served as my raffle ticket) and received a homemade cupcake (yes real butter, organic eggs, buttermilk, Philadelphia cream cheese and vanilla extract was used—couldn’t expect a tasty and moist cupcake otherwise). Each child had a choice of Lemon-Vanilla or Red Velvet (the obvious winner!) and then would smooth on some frosting and top with chocolate or colored sprinkles, some even made faces using Cheerios. The kids had a ball! Some took their masterpieces home; some couldn’t wait to dig in! But each child took pride in their work and enjoyed. The raffle prize? A cooking utensil and a personalized A Pinch of Salt apron given to Timothy Christopher from 1st grade. Congrats! As for me, I think it will take some time before I indulge in a cupcake after making so many, but life is too short to not indulge in a delicious and compact childhood memory so a few days will suffice. A Tree Grows In Brooklyn....And So Does Treats! Rachel Ray (aka EVOO) suggest when traveling to "ask the locals." That's exactly what we did this weekend. Alex and I visited the Brooklyn Botanical Gardens after hearing rave reviews of the cherry blossoms. As a child my family and I would often frequent the gardens (and then head to Prospect Park!) Saturday, being a great day to be outdoors, inhale the fresh air and take in the crisp, but rather warm weather seemed perfect! Falling in love with the plants, flowers and trees that shower the Brooklyn Botanical Gardens served as an added bonus. After two hours of trailing, Alex and I worked up a sweet tooth. Truth of the matter is that for us spring and ice cream are synonymous! No longer familiar with Brooklyn, I Yelped dessert places nearby. Okay, perhaps not exactly "asking the locals", but in today's modern world it's sort of the same thing. Shortly after we were driving to 5th Avenue in Park Slope, to a dessert café called The Chocolate Room. The menu consists of a few categories: Desserts, Ice Cream and Shakes and highlights a few items that are truly classic: Sundaes, Chocolate Room Pudding, Brownie Sundae and Fondue! We sat there and contemplated the menu (unusual for us since we also know what we want to order). But being here in the presence of multiple chocolately—and seemingly endless—options, it was impossible to narrow it down! As soon as we did, and were seconds from ordering, the waitress brought out an order for the table beside us that looked truly amazing! So naturally that totally through us for a loop and we were back where we started! 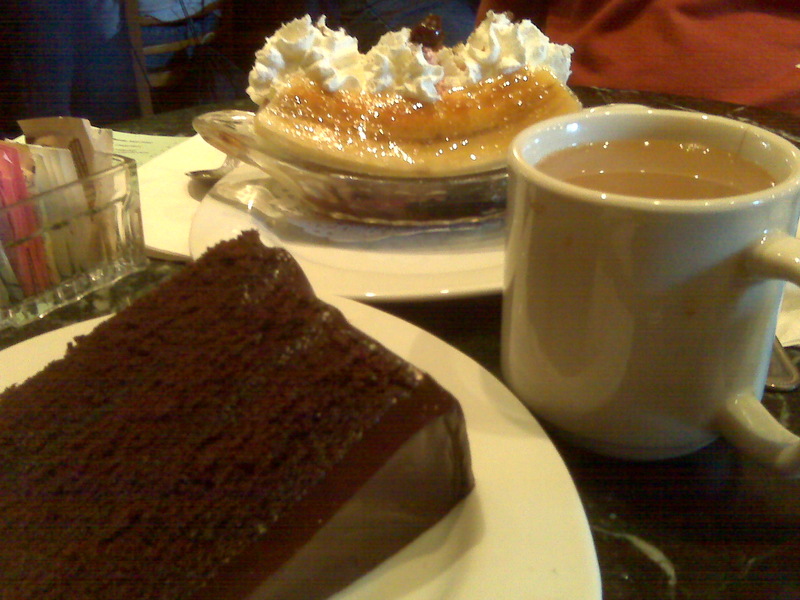 Finally, Alex made his final decision: Banana Split and I ordered the Chocolate Layer Cake (Suggested by Oprah Magazine) and a cup of Joe! My goodness, when then came out I thought I was in heaven! They looked picture perfect and tasted absolutely decadent! Alex and I behaved, and shared desserts. With each mouthful we took a minute to close our eyes—ignore each other for a sec—and take in the whole experience. And what an experience it was, sinfully delicious! A few moments later we noticed a group nearby sharing our enthusiasm! We began chatting about how delicious this spot was. The man stated that he recently moved from Queens a year ago. New to the neighborhood, he stumbled on this hot spot. After dining here a few times he knew it was the perfect place to take his two friends who currently joined him—both out of towners! It was true, by the look on his guest faces you could see how delighted they were! Not only was he right, but so were the hundreds of reviews written on yelp. So you see, we did ask the locals one way or another. Brooklyn proved again to be a great spot for embracing nature and all those deliciously naughty pleasures that comes with the arrival of spring and provided a memory reminiscent of my childhood—what a delicious way to spend a day! A close girlfriend of mine is Asian and definitely has an appreciation for fresh, local vegetables and ingredients. Ling frequents Chinatown. She’s either shopping for wonderful products: fresh fish, veggies like bok choy, Chinese broccoli, long green beans or whatever looks fresh that day or heading to markets for peking duck, roasted chicken, or roast pork. 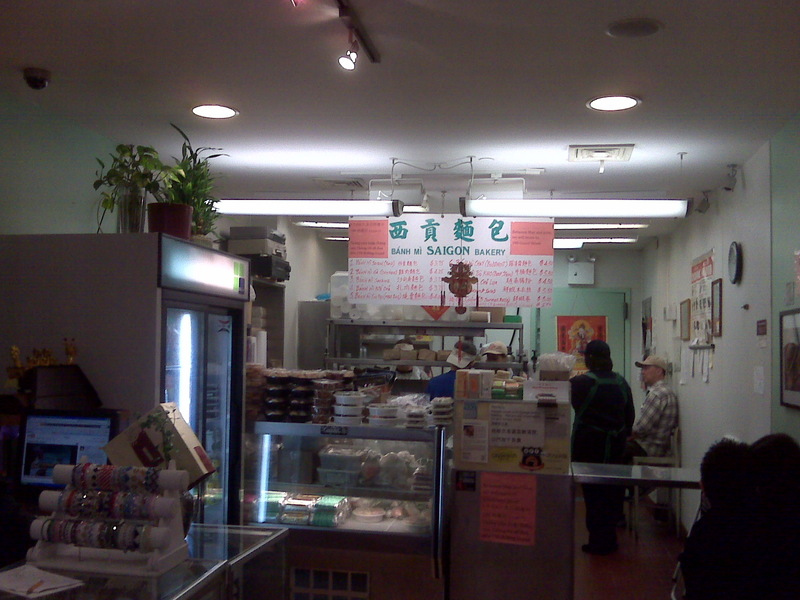 This also means that Ling knows where some of the best deals and phenomenal cheap eats are in Chinatown. After telling her of my recent visit to Nicky's Vietnamese Sandwiches (after they were aired on an episode of The Best Thing I Ever Ate on Food Network) Ling told me about a Vietemanese sandwich shop on Mott Street that her and her sister have been hooked on. The catch? The shop is located in the back of a jewelry shop. I decided to yelp Banh Mi Saigon Bakery and was surprised of how many countless reviews supported Ling's account. I was extremely excited to go! When Ling and I made it to Mott Street my excitement was put to a halt! The store was closed for minor renovations. What a disappointment! Fortunately Di Palo's (my favorite Italian specialty shop) is across the street so all was not lost. Yesterday luck was on my side! Ling and I met up for our weekly dosage of lunch and catch up. Unlike other times where we debate over "what's for lunch?" I knew exactly where I wanted to eat—Banh Mi Saigon Bakery!!! 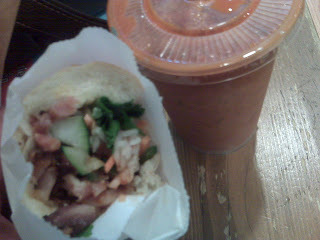 I indulged in a Banh Mi Ga (#2 on their menu) the Chicken sandwich! As with most classic Vietnamese sandwiches it's served on a crunchy, yet tenderly moist baguette, with toppings like cilantro, jalapeño, daikon and carrots, cucumber nestled on top of the moist, tender, fried pieces of chicken. If chicken doesn’t interest you, other options like pork, sardine, pate, meatball, Buddhist and beef stew are available. My chicken sandwich was incredible, satisfying and perfectly balanced—sweet, tangy, and a tad spicy! Don't get me wrong, if you are by 2nd Street and Ave A&B Nicky's Vietnamese Sandwiches is delicious, but if you’re in the heart of Chinatown (138-01 Mott Street to be exact!) definitely make a stop in, you will not be disappointed. Banh Mi Saigon Bakery is a precious gem for sure.